I originally found this recipe for pumpkin chili when I was looking for recipes to share for a pumpkin class. The original recipe came from Thug Kitchen and was pretty fabulous. I’ve upped the tomatoes and vegetables and adjusted it a little to make it my own, which is what you should do with any good chili recipe. To make your own pumpkin puree, find yourself a sugar pumpkin. Don’t use a regular carving pumpkin – they won’t taste as sweet and you’ll be wasting your time. Wash the pumpkin, cut it in half, and remove the seeds and strings. 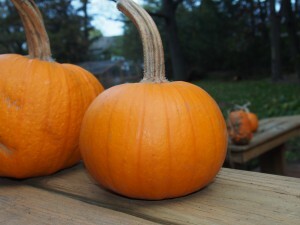 To cook the pumpkin, you can either roast the halves, cut side down, in a roasting pan with a cup of water. It’ll take about 30-40 minutes at 400 degrees. Alternatively, you can pressure cook the halves for about 6 minutes on high pressure – remember to 1/2 a cup of water or your cooker’s minimum liquid amount. The pumpkin is done with you can easily stick a fork in through the skin. Once the pumpkin is cooked, let it cool, scrape out the flesh and puree it in your blender or food processor until smooth. You can use any type of beans in this recipe. The recipe is written for using canned beans or soaked dried beans. If you use dried beans, you have the option for cooking them before adding them to the soup or pressure cooking them as part of the soup. Cooking them before adding, let’s you mix and match your beans in the soup. Save the cooking liquid for the beans and use it in the soup instead of broth or water. I’ve used combinations of black, cannellini, and kidney beans. 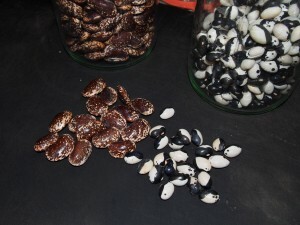 If you choose to pressure cook the beans with the soup, either use one type of bean, or pick beans that are about the same size so they cook the at the same rate. Black beans can cook as quickly as 3 minutes under pressure, but cannellini or kidney can take 6 minutes. Adjust the pressure cooking time to the beans that you are using. This is a great fall recipe. It uses pureed pumpkin, tomatoes, beans, and comes together quickly. Heat the olive oil in a large stockpot over medium heat. Sauté the onion, carrots, and peppers until soft - it's okay if they brown a little - about 5 minutes. Add chili powder, cumin, garlic, jalapeno, and amino acids. Sauté for 30 seconds. Add tomatoes, pumpkin, broth and beans and bring to a simmer. Allow to simmer on the stove for about 30 minutes before serving. * pressure cooker method - use soaked, dried beans. In step three, add remaining ingredients and pressure cook on high for 6 minutes for a medium size bean (see above notes for more info on cooking times). Done.